Who Gets Flowers at a Wedding? Flowers are such a big part of weddings, but when it comes to planning wedding flowers for yourself, you might not know where to start. This often leads to the question of who gets flowers at your wedding. Obviously, the biggest or most impressive bouquet will go to the bride. 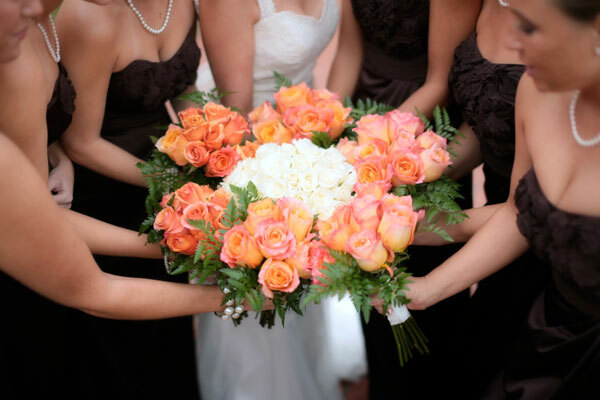 As the bride, you’ll carry a bouquet that will set the tone for other bouquets. Your maid of honor will need her own bouquet. This can be similar to the brides, or completely different. It shouldn’t outshine the bride’s, though. Any other bridesmaids should also carry bouquets. These are often in keeping with the maid of honor’s bouquet, but a smaller version of it. The groom should have a buttonhole flower. This often matches part of the bride’s bouquet, but can just be something in the wedding colors. The best man and other groomsmen will also wear a buttonhole flower each. These can all be identical, or have some variation. Of course, you don’t need to stop there. The page boy should have a small buttonhole flower, and the flower girl can carry a small bouquet if she’s not scattering petals. Other important people, such as ushers and the parents of the bride and groom can also wear buttonhole flowers or corsages. Whether you keep the flowers limited or give them to all the guests is really up to you. When you work with a great Wisconsin florist, you can come up with the perfect solution for your wedding. To find out what we can do to help you, get in touch today! Previous Summer’s Here, and So Are Summer Flowers!